Next week Pradip Swarnakar and I will be presenting our concept of the Sustainability Experimentation Venture Network (SEVeN) during a conference call of the Sustainability Transitions Research Network’s newly formed network on “Transition Studies in Latin America and Caribbean, Asia & Africa” (LACASAF). As we think this project through and receive feedback on the idea we continue to refine the concept. In preparation we wrote a concept paper that provides detail above and beyond what I’ve written on my SEVeN page or in previous posts here and here, so I thought it would be useful to post it here. In particular, the concept paper connects our conceptualization of SEVeN to the body of literature out of behavioral psychology on small experiments. 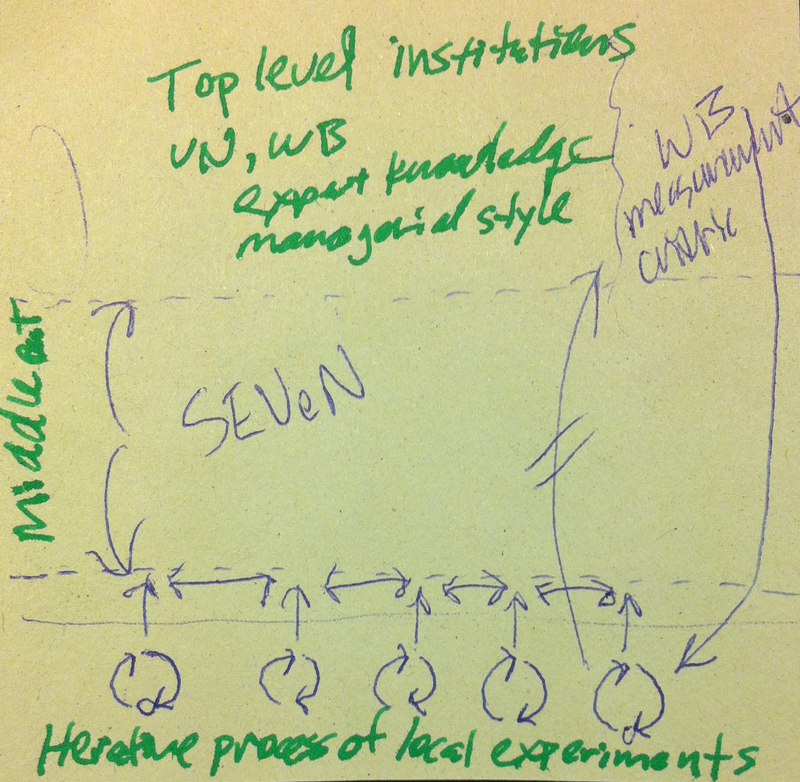 Another new development, though one we’ve not integrated into the concept paper yet, is the framing of SEVeN as a mechanism for overcoming the institutional, informational, cultural and other barriers that have prevented bottom-up and top-down approaches to sustainable development from finding common ground. On one hand, you have research like that by Mansuri and Rao (2004) reporting that not a single study establishes a causal relationship between the participatory elements of community-based development projects and intended outcomes. In other words, the $7 billion the World Bank has spent on community-based and -driven development projects has been more or less wasted. On the other hand, many grassroots or community-based development efforts are simply not designed with the intention of contributing to global goals of sustainable development or sustainability transitions. SEVeN: A “middle-out” mechanism for sustainable development? We’re beginning to visualize this gap, as our back-of-the envelope (or back-of-the-sticky note) drawing at left illustrates. The loops at the bottom represent the iterative process of projects, experiments and other community-based efforts at development. These efforts produce local knowledge that feeds back into local systems so that efforts can be incrementally modified for improvement. But the mechanisms are weak for diffusing this knowledge horizontally (to other communities) and vertically (to top-down institutions like the World Bank or UN). Stay tuned for more developments in our thinking along these lines. For now, here is the concept paper we’ll be discussing next week. Given the scale and speed of global climate change and its attendant socioecological disruptions, there is an urgent need to understand across multiple social, geographical and temporal scales the driving forces of sustainability transitions. Community-based sustainability experiments–often little more than tinkering or muddling in livelihood and survival strategies–represent an understudied dimension of sustainability transitions. Human beings historically have generated extensive local knowledges in response to changing environments. Locally produced knowledge applied locally has been effective at facilitating incremental change. Can this knowledge, if aggregated and disseminated, facilitate transformative change at multiple scales? The aim of the Sustainability Experimentation Venture Network1 (SEVeN) is to aggregate case studies and other reports of community-based sustainability experiments to develop a knowledge base for community-based sustainability experimentation processes that can be leveraged by a wide range of decision-makers and actors at multiple levels. Combining the power of the descriptive richness of qualitative case studies with the analytical power of natural language processing, SEVeN holds the potential to bring to bear an understanding of the influence of belief systems, political interests, power and culture to offer insight into: how and when community-based sustainability experiments are deployed; what shapes their success and failure; the factors influencing the adoption and diffusion of innovations resulting from sustainability experiments; and the conditions for community-based sustainability experiments to be scaled up to higher levels. Given its particular interest in small-scale community-based experiments, SEVeN will focus initially on developing societies where vulnerability to climate change is already driving innovation in livelihood and survival strategies. We want to explore the potential for knowledge produced at this level to accelerate, through both horizontal diffusion and vertical uptake by higher level decision-making institutions, progress towards the human development and sustainability transition goals that are assumed to require top-down planning and implementation. Additionally, through SEVeN we hope to help build the network linkages to higher-level institutions where the local-level knowledge produced can be leveraged to assist developed societies that are trying to find ways to stimulate innovation to forge their own pathways to transition. Training and capacity-building for non-academic citizens to produce scientific knowledge by contributing their own sustainability experiments, experiences and narratives to the SEVeN database; and to utilize the database to adapt and develop localized approaches to sustainability experimentation. New forms of knowledge to decision-makers, funders, and other stakeholders emphasizing how social factors in sustainability experiments can shape sustainability transitions. Enhanced knowledge production capabilities in communities that builds resilience and facilitates sustainability transitions. Climate change and other global environmental change challenges elicit the kinds of sophisticated large-scale socio-techno solutions that sustainability transitions research emerged to address.3 Yet the potentials of such solutions are often unrealized in developing countries due to imbalances of power, economic inequality, cultural barriers, and other social factors that prevent the dissemination and flow of information, knowledge, capital, and other resources necessary to drive socio-technical regime change. Meanwhile, community-based sustainability experiments seem to be occurring in unique niches with weaker path dependencies and lock-ins. Spatially situated in developing societies, these communities have not received extensive attention in sustainability transitions research.4 Yet, existing case studies point to significant capabilities within these communities to adapt to changes.5 Furthermore, it is in these communities that climate chaos and resource shortages are already causing socio-ecological disruptions to which individuals, families, tribes and communities are responding daily. We call these heuristic responses “community-based sustainability experiments” and define them as local experiments, originating in communities, in alternative behaviors, practices, traditions, technologies, and institutions to sustain individuals, groups or communities in the face of socio-ecological disruption or as strategies to anticipate future changes. This definition varies slightly from Berkhout, Wieczorek & Raven, who define sustainability experiments as “planned initiatives that embody a highly-novel socio-technical configuration likely to lead to substantial (environmental) sustainability gains (2011: 370). Other definitions of sustainability experiments similarly specify that sustainability experiments are “planned,” “purposive” or “strategic” interventions with the stated intention of capturing new types of learning or experience (e.g., Castán Broto and Bulkeley 2013). With respect to socio-technical experiments, the definitions become even narrower (see Brown et al. 2003). Our motive in employing a definition that is at once open to unplanned activities without specific or stated goals and broad enough to include reactive and adaptive strategies is to examine the potential of spontaneous and bottom-up experiments to open up new ways of thinking about innovation and change that otherwise might not occur within the top-down institutions engaging in planned efforts to steer sustainability transitions. A significant challenge posed by the breadth of such a definition is establishing criteria for exclusion of cases. We plan to address this challenge in the pilot stage of SEVeN. The pilot stage will rely on existing published case study research of sustainability experiments to begin populating the SEVeN database. A major limitation of published case studies is the variation in methods, frameworks and vocabulary used in reporting findings. Fortunately, advances in natural language processing through machine-learning now make possible the meaningful analysis of large corpora of documents such as published case study analysis of community-based sustainability experiments using discipline-specific terminology. Following a proof of concept using published case study research to address the problem of lack of standardization in academic case studies, SEVeN would expand the type, range and sources of reports on community-based sustainability experiments. By adding lay perspectives on experiments to the database, for example, SEVeN can access community-based knowledge in a way that field research conducted by trained academics cannot. Community partners would also collaborate in the development of relevant codes to create a database structure that produces information on sustainability experiments that is accessible across levels of expertise and cultural differences. One approach we envision would entail a “Case Study Hackathon” where academics, nonprofits, community partners, and government partners collaborate to identify the necessary fields of data for capturing the essential characteristics of sustainability experiments. These fields, in turn, will be used to simplify into plain language existing academic case studies, while also providing a structure for contributions of non-academic and multi-media “case studies” (i.e., narratives). Because expansion of the database will require crowdsourcing reports on sustainability experiments, the hackathon is a vital process of co-designing a case study model that is broad enough to capture diverse voices, sophisticated enough to produce useful findings, yet parsimonious enough to remain feasible and produce accessible data. Lessons learned by coastal communities in Bangladesh, for example, must be made accessible and relevant to coastal communities in Indonesia, Senegal, the Dominican Republic and Brazil. Small experiments are a framework to support problem-solving, as De Young (2014: 9) explains, “that is based on people’s innate inclinations to explore and understand (Kaplan and Kaplan 2003, 2009) and on their brain having evolved to prospect the future not just track the past (Seligman et al., 2013).” As important, small experiments support behavioral innovation and have the potential for rapid dissemination of findings. Finally, the ubiquity of small experiments makes them an ideal unit of analysis. “Small experiments are going on all the time,” contends De Young (2014). “Consider the many pilot programs, demonstration sites, field tests, and trial runs regularly reported in both popular and scientific publications, as well as [in] neighborhood, community, and village examples.” One challenge for SEVeN will be adapting the small experiments framework which so far has been applied in developed society contexts where small experiments fit the rather narrow definitions of sustainability experiments employed by transitions researchers. Small experiments happen in developing society contexts as well, but at the community level where SEVeN will focus there are fewer linkages to municipal governments and other institutions that might make them more discoverable. Almost by definition, the community-based sustainability experiments in developing societies that we intend to aggregate into the SEVeN database occur off the radar of the sustainable development apparatus that generally shapes sustainability experiments in developing societies. Despite this challenge, the small experiments framework remains useful. Psychologists interested in motivating environmental behavior change maintain that the scale of small experiments is ideal for engaging individuals. As De Young (2014) explains, the large scale at which environmental issues are perceived leads individuals to believe only large-scale responses will suffice, a belief that can explain at least a portion of the absence of widespread individual behavior change in developed societies. Focusing on community-based sustainability experiments in developing societies where more immediate pressures compel individuals to experiment with lifestyle and survival strategies, and perhaps even take greater risks in experimenting, might result in findings that prove to be quite instructive for designing behavior change strategies in developed societies. If so, then SEVeN can be a tool through which the development script is flipped and the Global South aids, rather than receives aid from, the North. It provides local innovators and leaders with extensive and systematic case study-derived knowledge to adapt and apply to local experiments. Its decentralized structure and horizontal rather than vertical linkages will provide peer-to-peer communication and diffusion of knowledge with the potential to overcome imbalances of power, economic inequality, cultural barriers, and other social factors that prevent the dissemination, flow and implementation of sustainability solutions. Its fusing of sustainability transitions perspectives with the lesser known concepts of adaptive muddling and small experiments offers the potential to answer some of the key questions confronting sustainability transitions research related to community-based innovations. 1 The notion of a “venture” network intentionally evokes the idea that experiments in response to climate change and other socio-ecological disruptions may be risky or daring, but must be undertaken if the transformation to sustainability is to be realized. Similar to the “venture” in venture capital, which is financial capital provided to early-stage, experimental start-up companies with high-potential and high-risk, SEVeN emphasizes the need to “invest” in sustainability experiments. 2 These are reframings of questions asked by Markard, Raven & Truffer (2012, 962) about transitions. It is important to note that other researchers are also beginning to answer these questions theoretically (Avelino and Rotmans, 2009; Hoffman, 2013) and empirically (Avelino, 2011). SEVeN focuses on the role of social factors like power in the implementation and diffusion of innovations derived from sustainability experiments. 3 See Lachman (2013) and Markard, Raven & Truffer (2012) for overviews of the field. 4 Berkhout, Wieczorek & Raven’s (2011) work on sustainability transitions in “latecomer” countries is an important exception, as is the work on grassroots innovations, although not all of it focused in developing countries, by Seyfang, Smith, and others (see Seyfang and Smith 2007; Seyfang and Haxeltine 2012; Seyfang and Longhurst 2013; Gupta et al. 2003; Smith, Fressoli and Thomas 2013). 5 See the “capabilities approach” to justice advanced by Sen (2005), Nussbaum (2000), Schlosberg (2009) and others. 6 Advocates of the adaptive muddling perspective have pointed out how it is similar yet distinct from the adaptive management perspective common in ecosystem and natural resource management (e.g., Holling 1978, Walters 1986). Whereas adaptive management is usually project-based with no intent to spread findings beyond the project, dissemination beyond the immediate project at hand is a central feature of the small experiments concept. 7 See Wollenberg et al. (2007). Avelino, F. and J. Rotmans. 2009. “Power in transition: An interdisciplinary framework to study power in relation to structural change.” European Journal of Social Theory 12(4):543–569. Berkhout, F., Wieczorek, Anna, & Raven, Rob. 2011. “Avoiding environmental convergence: A possible role for sustainability experiments in latecomer countries?” International Journal of Institutions and Economies 3(2):367-385. Brown, H. S., Vergragt, P., Green, K., & Berchicci, L. 2003. “Learning for sustainability transition through bounded socio-technical experiments in personal mobility.” Technology Analysis & Strategic Management, 15(3), 291-315. Castán Broto, V. & Bulkeley, H., 2013. A survey of urban climate change experiments in 100 cities. Global Environmental Change 23: 92–102. De Young, R. (2014). Some behavioral aspects of energy descent: how a biophysical psychology might help people transition through the lean times ahead. Frontiers in psychology, Vol. 5, Article 1255: 1-16. Gupta, A.K., et al., 2003. Mobilizing grassroots’ technological innovations and traditional knowledge, values and institutions: articulating social and ethical capital. Futures 35 (9) 975–987. Hoffman, J. 2013. “Theorizing power in transition studies: The role of creativity and novel practices in structural change.” Policy Sciences 46:257–275. Holling, C. S. (ed.). 1978. Adaptive environmental assessment and management. John Wiley and Sons: New York. Irvine, K. N., & Kaplan, S. 2001. Coping with change: The small experiment as a strategic approach to environmental sustainability. Environmental Management, 28(6), 713-725. Kaplan R. (1996). “The small experiment: achieving more with less.” In Public and Private Places, (Pp. 170–174), Nasar J. L., Brown B. B., editors. Edmond, OK: Environmental Design Research Association. Lachman, D.A. 2013. “A survey and review of approaches to study transitions.” Energy Policy 58(July):269-276. Markard, J., R. Raven, and B. Truffer. 2012. “Sustainability transitions: An emerging field of research and its prospects.” Research Policy 41(6):968-979. Nussbaum, M. C. 2000. Women and Human Development: The Capabilities Approach. Oxford, UK: Oxford University Press. Sen, A. 2005. “Human rights and capabilities.” Journal of Human Development 6(2):151–166. Seyfang, G., & Haxeltine, A. 2012. Growing grassroots innovations: exploring the role of community-based initiatives in governing sustainable energy transitions. Environment and Planning C: Governing and Policy, 30(3), 381–400. Seyfang, G. & Longhurst, N., 2013. Desperately seeking niches: grassroots innovations and niche development in the community currency field. Global Environmental Change 23 (5) 881–891. Seyfang, G. & Smith, A., 2007. Grassroots innovations for sustainable development: towards a new research and policy agenda. Environmental Politics 16 (4) 584–603. Smith, A., Fressoli, M., Thomas, H., 2013. Grassroots innovation movements: contrbutions and challenges. Journal of Cleaner Production (in press). Schlosberg, D. 2009. “Capacity and capabilities: A response to the greenhouse development rights framework.” Ethics, Place and Environment 12(3): 287-290. Walters, C.J. 1986. Adaptive management of renewable resources. MacMillan Publishing Company: New York.